When it comes to buying all the latest makeup products or tools and accessories, I'm the total opposite. Sorry but I'm not really much of a risk taker, except when it comes to hair products! But there is something I love almost as much and that's makeup brushes. It's the most important part to applying makeup. For me It's hard to find a good brush set and I'm a very picky person. I like to play it safe with brands I'm use to buying from. Until recently I decided to step outside the box and try something new. For a while now I've been trying to use more cruelty free products. That's when I saw a lot of people talking about Indy Luxe on social media. I knew I had to check them out and I'm glad I did! 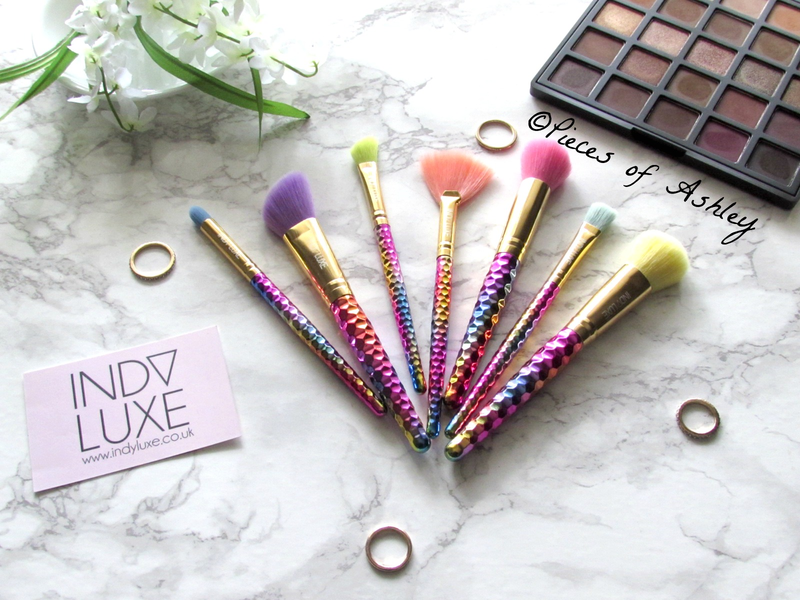 Indy Luxe is an online Vegan and Cruelty Free company and their brushes are gorgeous. When they introduced this rainbow collection, I knew I had to buy them. These brushes are just as beautiful in person as they are online. This is a seven piece brush set that can be used for the face and the eyes. The brushes are rainbow soft synthetic fibers. When applying these brushes it doesn't leave a harsh feeling on my skin, like other brushes I've used. The rainbow hexagonal prism handles give me a good grip while using. If you're into a good highlight on the cheekbones I recommend using the orange fan brush. The eyeshadow brushes are my favorite, just because I focus on my eyes the most. These brushes on gentle on the skin and I didn't experience redness. The three bigger brushes can be used for applying powder, bronzer, and blending! If you want to own this gorgeous rainbow brush set it £24 in UK and about $30.93 in US. You can use my code PIECESOFASHLEY20 for 20% off! *I purchased this brush with my own money, however I received a discount. Affiliate code is included in this post. Every time my code is used I will receive 5% commission. Checkout the rainbow brush set in the link below! Thank you Nicky! Indy Luxe does have great brushes, I definitely going to buy some more. I am having a nice productive day, I hope you're having a great day too!! Ashley! I love these brushes!! I'm so impressed that they're a vegan and cruelty-free company as well, that's always a great sign. 8 TV Shows You Should Watch! Bringing Back The 30 Day Squat Challenge! 6 Beauty Instagrams You Should Checkout! LipSense & ShadowSense Makeup Giveaway!